We had been signed up for this Angel Flight for awhile but as time neared it came close to being canceled due to not having another pilot for the second leg (this flight originally was set up as two individual legs between Pittsburgh PA and Columbia SC with a stop in Blacksburg VA) So to keep the mission from being canceled and our passengers not having a flight home, we decided to do the entire flight non stop from Pittsburgh to Columbia. Our flight to Pittsburgh was smooth as we headed slightly northwest over the Alleghany Mountains thru West Virginia and Maryland to Pennsylvania. Pittsburgh is a fairly short flight from home base (and one we make quite often). Our flight time up was 1.2 hours covering 126 nautical miles. In Pittsburgh (Alleghany County Airport) we found our passenger Ernest and his wife, Louise, right on time and waiting for us in the FBO lobby. 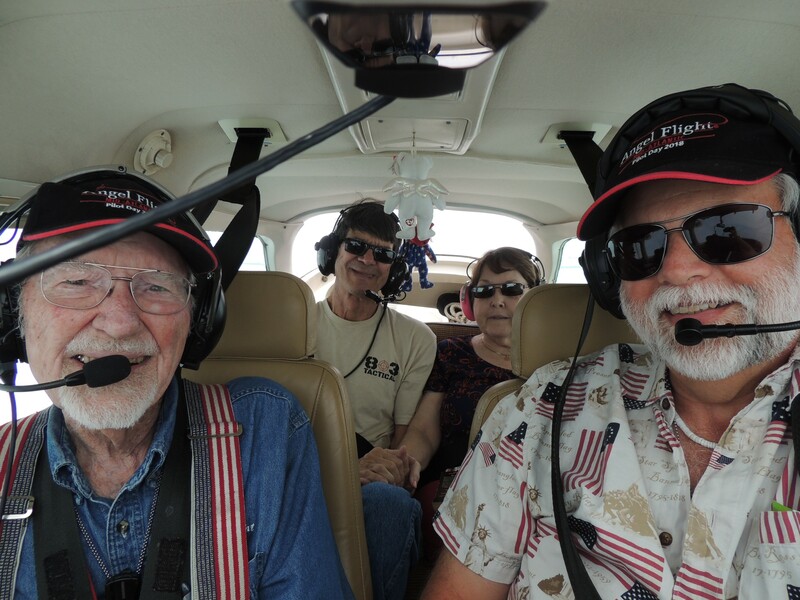 This would be their first time flying with us and they were so happy that we took on the entire mission seeing to it that that had a way back home! After our greetings and taking care of some very necessary things (such as a bathroom visit…..it would be a three plus hour flight to SC) we loaded up and departed Pittsburgh heading south to Columbia SC. Our flight to Columbia was a long one (3.5 hours) covering 402 nautical miles, but even so, time flew by (I had to say that!) and our flight conditions were good with fairly smooth air as we traveled in and out of the clouds. As we neared Columbia, a storm cell was working west of the field and our instrument approach we made to get down thru the clouds took us right into it, but really it was no more than just a little light rain as we turned in on our final approach to land. After getting inside the FBO at Eagle Air, it was very nice seeing a sign showing “Restrooms”…… being in the air that long kind of pushes the limit! Ernest and Louise were so glad to be home and let us know again how grateful they were to us for doing the entire mission. After we said our goodbyes and took a group photo, we waved to them as they headed out to their car ready to drive home. Our flight back home was also fairly long (2.9 hours) covering 316 miles with good flight conditions. As we neared home base our thoughts were on that nice cup of coffee (first of the day) that we would have after tucking 49Bravo back into her hanger! Our total flight time for this double mission was 7.6 hours covering 840 miles over 6 States! It was a long day, but very rewarding getting to fly Ernest and his wife and knowing that they did not have to worry about how they would have got home otherwise. A little interesting tidbit….. if we would have driven to Pittsburgh PA then to Columbia SC and back home, the total time would have been well over 19 hours! One our way to Columbia SC with Ernest and his wife, Louise. Heading back home, eager for COFFEE! Now this has to look like something! Our office for the day! shapely cloud cover, I think of that song of the late ’40s….I read more about you, Captain John Billings. You were a terror with the 885th. and I was right behind you. It does look like a puppy Ralph! (From now on I will think about that song as well) Thank goodness our Country had great guys like you and Captain John and Tom Creekmore defending it! Thank You All For Your Service! Thank you Nevin, Sir! I flew a night mission with the then, 1st. Lt. Billings, on April 10/11. 1945. He must have been 22, but I was 19. And, he’s still flying. God Bless both of you for your charitable work. I thank you on behalf of all those people you have selflessly helped. You didn’t tell about having to go to 10,000 feet to get pass Charlotte, NC. What is the highest you two have flown on a mission. Congratulations Nevin on number 300. Capt. John has a birthday coming up. What year was he born? I was born in 1923. I was wondering if the Capt. is younger or older than I am. You all are an amazing group of guys….. have you saw the picture of Captain John with Bob Dole? Thank you so much Esther……. we are really looking forward to our flights with Elaine over Captain Johns Birthday ! So inspiring! What you guys do. I’ve just been reading the biography of John Adams who came from the same part of South Eastern Massachusetts as John Billings. There maybe something in the water up there! Thank the Good Lord for men like these! We need more water like that these days! A beautiful commentary, Patricia. Thank you. And, yes, what those boys are doing are going above and beyond the call of duty as humans. With individuals such as these 2, we would never have wars. I worked in a record shop when Johnny Ray’s “Cry” came out and the “B” side was the, The Little White Cloud That Cried. And you lived in London at the time? That little cloud traveled all over that pond to be heard by you. Frisky sure made the rounds. Nice meeting you, Patricia. Thank you so much Ralph. It is always a pleasure to read about about the kindness of our guys. Also to read the comments by others – so civil and thoughtful – just what we all need. I lived on the outskirts of London and took a “steam” train to London with friends to see Johnny – thanks to that cloud. Wonderful memories. Thanks for bringing them back to me. I still have that record on an OKEH, 78. I’m happy to know I can still bring cheer to my friends whom I will never see. Nevin and Bilings and all those other kind pilots who look at clouds as animate objects, “Keep on flying”.. From now on, I’ll always be watching for those adorable, frisky puppies, thanks to you, Patricia. All of you have made this a better world for me. Once you get into the “step into response” mode, having decided to do the whole flight, careful planning and focus a well as experience with many Angel Flights make it so rewarding. And, not having to contend with lousy weather is a real plus. A 3.5 hour leg starts feeling kind of long at about 2.5 hours, though! Not many bathrooms on 49B so good not to drink coffee until after the flight! Hopefully the folks you were flying knew that, too! Richard you are so right…… no coffee on these type of flight days! Our passengers knew a day in advance and were so happy to just know they would get home. Now, if we had a ” Pilatus PC-12 ” there would be no problem…… nice bathroom on board (we could even have coffee in route)…….. do you know of anyone who would like to sponsor with one?